Artemi collecting data from a raingauge. Fiorentina site. Merche on a fire affected woodland. Sierra de Enguera, Spain. Cerdà, A., Hooke, J. Romero-Diaz, A., Montanarella, L., Lavee, H. 2010. Soil erosion on Mediterranean Type-Ecosystems Land Degradation and Development. Editors. DOI 10.1002/ldr.968. Giménez Morera, A., Ruiz Sinoga, J.D. y Cerdà, A. 2010. The impact of cotton geotextiles on soil and water losses in Mediterranean rainfed agricultural land. Land Degradation and Development , 210- 217. DOI: 10.1002/ldr.971. García-Fayos, P., Bochet, E. y Cerdà, A. 2010. Seed removal susceptibility through soil erosion shapes vegetation composition. Plant Soil, in presss, DOI 10.1007/s11104-010-0382-6. García-Orenes, F., Guerrero, C., Roldán, A., Mataix-Solera, J., Cerdá, A., Campoy, M., Zornoza, R., Bárcenas, G., y Caravaca, F. 2010. Soil microbial biomass and activity under different agricultural management systems in a semiarid Mediterranean agroecosystem. Soil and Tillage Research, In press. González-Hidalgo, J.C., Batalla, R.J., Cerdà, A. y de Luis, M. 2010. Contribution of the lartest events to suspended sediment transport across the USA. Land Degradation & Development, 83-91. DOI: 10.1002/ldr.897. Lasanta, A & Cerdà, A. 2005. Long-term erosional responses after fire in the Central Spanish Pyrenees: 2. Solute release. Catena, 60, 80-101.Ceballos, A. Cerdà, A. & Schnabel. 2003. Runoff production and erosion processes on a Dehesa in Western Spain. Geographical Review, 3, 333-353. Cerdà, A. 2002. The effect of season and parent material on water erosion on highly eroded soils in eastern Spain. Journal of Arid Environments, 52, 319-337. Cerdà, A. & P. García-Fayos, P. 2002. The influence of seed size and shape on their removal by water erosion. Catena, 48, 293-301. Cerdà, A. 2001. Effects of rock fragment on soil infiltration, inter-rill runoff and erosion. European Journal of Soil Science, 52 (1) 1-10. Cerdà, A. 2000. Aggregate stability against water forces under different climates on agriculture land and scrubland in southern Bolivia. Soil and Tillage Research, 36, 1- 8. García-Fayos, P. García-Ventoso, B. & Cerdà, A. 2000. 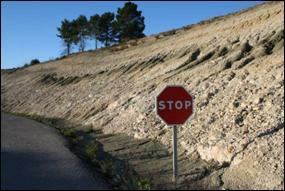 Limitations to Plant establishment on eroded slopes in Southeastern Spain. Journal of Vegetation Science, 11- 77- 86. Cerdà, A. 1999. Seasonal and spatial variations in infiltration rates in badland surfaces under Mediterranean climatic conditions. Water Resources Research, 35 (1) 319-328. Bergkamp, G., Cerdà, A., & Imeson, A.C.1999. Magnitude-frequency analysis of water redistribuiton along a climate gradient in Spain. Catena, 37, 129-146. Cerdà, A. 1998. Postfire dynamics of erosional processes under mediterranean climatic conditions. Zeitschrift für Geomorphologie, 42 (3) 373-398. Cerdà, A., Schnabel, S., Gómez-Amelia, D. & Ceballos, A. 1998. Soil hydrological Response under simulated rainfall in the Dehesa ecosystem, Extremadura, SW, Spain. Earth Surface Processes and Landforms, 23, 195- 209. Cerdà, A. The influence of geomorphological position on the erosional and hydrological processes on a Mediterranean slope. Hydrological Processes, 12 (3) 661- 671. Cerdà, A. 1998. Soil aggregate stability under different Mediterranean vegetation types. Catena, 32, 73-86. Cerdà, A. 1998. Changes in overland flow and infiltration after a rangeland fire in a Mediterranean scrubland. Hydrological Processes, 12, 1031-1042. Cerdà, A. 1998. Effect of climate on surface flow along a climatological gradient in Israel. A field rainfall simulation approach. Journal of Arid Environments, 38, 145-159. Cerdà, A. 1998. The influence of aspect and vegetation on seasonal changes in erosion under rainfall simulation on a clay soil in Spain. Canadian Journal of Soil Science, 78, 321-330. Cerdà, A. Relationship between climate and soil hydrological and erosional characteristics along climatic gradients in Mediterranean limestone areas. Geomorphology, 25, 123-134. Imeson, A.C., Lavee, H., Calvo, A. & Cerdà, A. 1998. The erosional response of calcareous soils along a climatological gradient in Southeast Spain. Geomorphology, 24, 3-16. Cerdà, A. & García-Fayos, P.1997. The influence of slope angle on sediment, water and seed losses on badland landscapes. Geomorphology, 18, 77-90. García-Fayos, P. & Cerdà, A. 1997. Seed losses by surface wash in degraded mediterranean environments. Catena, 29, 73-83. Cerdà, A.1997. Soil erosion after land abandonment in a semiarid environment of Southeastern Spain. Arid Soil Research and Rehabilitation, 11, 163-176. Cerdà, A. 1997. The effect of patchy distribution of Stipa tenacissima L. on runoff and erosion. Journal of Arid Environments, 36, 37-51. Cerdà, A., Ibáñez, S. & Calvo, A. 1997. Design and operation of a small and portable rainfall simulator for rugged terrain. Soil Technology, 11, (2) 161-168. Cerdà, A. 1997. Rainfall drop size distribution in Western Mediterranean Basin, València, Spain. Catena, 31, 23-38. Solé, A., Calvo, A., Cerdà, A., Lázaro, R., Pini, R. & Barbero, J. 1997. Influences of micro-relief patterns and plant cover on runoff related processes in badlands from Tabernas (SE Spain). Catena, 31, 23-38. Cerdà, A. 1996. Seasonal variability of infiltration rates under contrasting slope conditions in Southeast Spain. Geoderma, 69, 217-232. Cerdà, A. 1996. Soil aggregate stability in three mediterranean environments. Soil Technology, 9, 129-133. García-Fayos, P., Recatalà, Mª. T., Cerdà, A. & Calvo, A. 1995. Seed population dynamics on badland slopes in SE Spain. Journal of Vegetation Science, 6, 691-696. Cerdà, A., Imeson, A.C. & Calvo, A. 1995. Fire and aspect induced differences on the erodibility and hydrology of soils at La Costera, Valencia, Southeast Spain. Catena, 289-304. Cerdà, A. 1995. Soil moisture regime under simulated rainfall in a three years abandoned field in Southeast Spain. Physics and Chemistry of The Earth, 20 (3-4), 271-279. Soil erosion is the relocation of surface material, largely water, and takes place in three steps: removal, transport and sedimentation. It affects mineral as well as organic soil particles. The research topic studies processes, mechanisms, factors and measurement methods in different parts of the world (Bolivia, Israel, USA…) with special references to the Mediterranean region. Researches were carried out on silvo-pastoral land uses the Spanish Dehesa (Cáceres, SW Spain), Israel (from the Galilee Mountains to the Dead Sea), the Central Spanish Pyrenees, the south-eastern badlands areas of Spain and the mountains of eastern Spain. Vegetation/soil/erosion relations are examined using current scientific methods, with special reference to the vegetation-erosion interaction and removal of seeds by overland flow. The topic is moreover focussed on the effects of land use and management on soil erosion in order to develop strategies to reduce soil losses on degraded land. Soil erosion causes disturbances to the eroded soils. The transported particles also induce disturbances in fluvial systems (rivers, creeks, lagoons), and depositional locations (lakes, alluvial plains, deltas, etc.). The transported sediments can contain substances harmful to the environment due to their sources being located, for example on road embankments, mining areas, farms or degraded lands. Soil erosion is related to soil water dynamics. In this research topic surface and subsurface fluxes are examined in order to determine the runoff generation model which best fits Mediterranean soils, slopes and watersheds. Previous studies have demonstrated that the Hortonian runoff generation model does not fit, at any rate completely, the soil and topographical conditions of Mediterranean ecosystems. Partial areas and variable source area models seem more adequate due to the patchy spatial distribution of the vegetation, which determines the soil infiltration capacity and the runoff production. 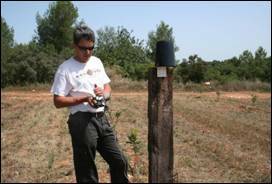 Since 1989 the hydrological response of soils has been studied using ring infiltrometers and simulated rainfall measurements, mainly focussed on infiltration capacity and soil water dynamics. Desertification is the loss of soil fertility in the arid, semiarid and dry sub-humid zones of the Earth. 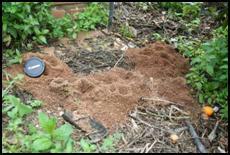 There may also be degradation of ecosystems due to overexploitation of water deficit areas. Desertification supposes the loss of natural of soil fertility, induced by the reduction of soil water capacity, degradation of soil structure, alteration of vegetation cover, development of surface crusts, interference with natural water fluxes and finally an increase in soil losses. Desertification processes are directly linked to human activities in the territory concerned. This research topic aims (i) to identify the changes suffered by ecosystems as a consequence of desertification and (ii) to design strategies to prevent them. Agriculture results in the reduction of vegetation cover, and an increase in overland flow and soil loss. In spite of the significance of agriculture to soil erosion, to date little work has been done on strategies to control erosion in Spain. This research topic is devoted to the assessment of the soil-erosion rates under different Mediterranean crops, with current emphasis on olive and orange groves. Strategies to control soil erosion are being developed and tested at the El Teularet Soil Erosion Experimental Station in the Sierra de Enguera in Eastern Spain. Other experimental stations are currently being designed to measure soil losses under crops such as vineyards, almonds and cereal, and also oranges newly-irrigated sloping land. 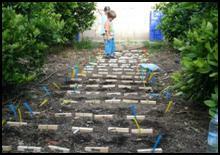 The strategies being developed to control soil erosion are tested under natural and simulated rainfall. Ground covers such as green manures, straw mulching and geo-textiles are being tested, together with more usual agricultural land management methods such as herbicides, ploughing and no-tillage. Road construction results in the development of artificial slopes -road embankments- in which soil erosion rates are extraordinarily high due to lack of vegetation cover, steepness of slopes angles and non-development of soils. During of road construction works increased soil erosion rates are triggered by the vegetation removal, soil disturbance and the transit of heavy vehicles. 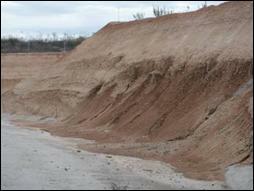 Strategies to control erosion are inadequate. The present research topic aims (i) to determine the rates of erosion of road embankments, railways embankments, mine-spoil banks and other environments where soils are created by artificial earth-movement; and (ii) to develop strategies to reduce these high erosion rates to sustainable levels. 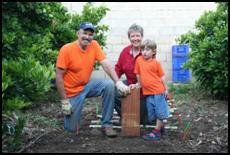 The use of geo-textiles, grassing, shrub- and tree-planting are among the strategies tested. Erosion control in these vulnerable environments is a key question for sustainable land development; especially in areas where building activity is extremely high such as coastal Spain. 3. Geomorphological effects of forest fire. The increase in land affected by forest fire in Spain during the 1970’s was due to the abandonment of the mountainous land, the increase in easily-burnt vegetation and the environmental conditions favourable to recurrent fires. Such fires cause sudden to vegetation cover and soils, which induce modification to geomorphological processes. In particular, after wildfire soil loss has been found to increase, which affects the recovery of vegetation and soils. 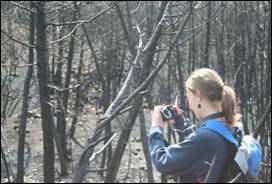 Currently, the research is focussed on the role that climate plays on the recovery in fire-affected land. For this purpose a climatic gradient from the Ebro basin to the Pyrenees is being studied to shed light on the effect of fire under different climatic conditions. The preliminary results show that in the driest areas fire induces an increase in soil erosion variability. These changes suggest that the variability of rates of geomorphological processes may increase with anticipated climate changes, especially those processes affected by forest fire. Recovery after soils after fire, and the effects of the changes in the vegetation cover on soil erosion rates are also being studied. 4. 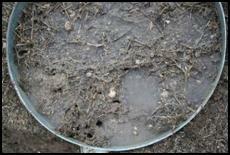 Soil organic matter decomposition network and fauna effects on soil. 1989-1993. Ph. D, University of Valencia. The infiltration capacity of soil of the Valencia Country. Factors and spatio-temporal variations (in Spanish). 2002 to present Professor Titular. Department of Geography. University of Valencia. 2001-2002 Científico Titular. Pyrenean Institute of Ecology. Spanish Council for Scientific Research. Zaragoza. 1999-2000 Researcher. Desertification Research Centre. Spanish Council for Scientific Research. Valencia. 1996-1998 Researcher. Department of Geography. University of Valencia. 1993-1995 Researcher. Fysisch Geografisch Bodemkunding Laboratorium. Universiteit van Amsterdam. 1992-1993 Researcher. Department of Geography. Bar-Ilan University, Israel. 1989-1992 Researcher. Department of Geography. University of Valencia, Spain. 2002 to present Degree in Geography. Degree in Environmental Sciences. University of Valencia. 1997-2002 Degree in Environmental Science Engineering. World University. 1989-2001 Degree in Geography. University of Valencia. Impacts of wildfires on hydrological processes and soil erosion: an Iberian perspective. ACIN - Acciones Integradas - Ministerio de Ciencia e Innovación. PT2009-0073. Universidasd de Aveiro. Jan Jacob Keiser. Las hormigas en los procesos edáficos, hidrológicos y erosivos. Conselleria d’Educació. Direcció General de Política Científica. BEST/2010/149. Artemi Cerdà. Efectos de los incendios forestales sobre los suelos (FUEGOREDIII). Acción complementaria.